The Facts: The Texans expect to have Fuller back in their lineup when they play the Saints in the season opener. The receiver, a deep threat opposite DeAndre Hopkins, continues to rehab from a torn anterior cruciate ligament. “Everything’s going well with Will,” GM Brian Gaine said at the team’s pre-draft news conference. “I won’t speak to specifics, but I anticipate when we kick off versus New Orleans, he’ll be ready to go. He’ll be at full speed by then." Diehards Line:The Texans felt good enough about Fuller’s return that they let Demaryius Thomas go. Fuller injured his right knee in an Oct. 25 game against the Dolphins. Fuller has 11 touchdowns in the 11 games he has played with Deshaun Watson. But Fuller missed six games in 2017 and nine last season. The Texans are counting on Fuller and Keke Coutee staying healthy and on the field to complement Hopkins. The Facts: Speculation on what the Cardinals will do with the No. 1 overall pick has continued to increase as the NFL Draft draws closer. The Cardinals say they haven't made a decision, but most analysts believe the team will move on from Rosen, the team's first-round pick in the 2018 draft. For his part, Rosen has stayed out of the media fray and didn't talk to reporters last week when the Cardinals kicked off the start of the voluntary offseason workout program. Rosen, though, recently talked to SI TV in an exclusive interview, which is behind a pay wall, about his current status with the team. "I think when people talk about, like, you can't listen to criticism or don't ever read articles, you have to be aware of what's going on to a certain extent," Rosen said in a short video clip of the segment posted on Twitter . "So I definitely understand the situation. I mean it's annoying, but it is what it is. Football is a business, and I definitely respect the higher-ups and their decisions." Diehards Line:The linking of Kyler Murray to the Cardinals was further fueled Wednesday night when the team posted a video on social media announcing the 2018 regular-season schedule. The short clip included some of the team's star players, including wide receiver Larry Fitzgerald, running back David Johnson and cornerback Patrick Peterson, among others. Noticeably absent with a full shot throughout the 90-second video? None other than the 10th overall pick of last year's draft. Rosen appears to be taking it in stride, though, and is ready to show he belongs in the NFL whether it's with the Cardinals or another team. "I think the best advice I've ever gotten in life from so many different people is control what you can control," Rosen told SI TV. "Whatever decisions that are made, it's my duty to prove them right if they keep me and prove them wrong if they ship me off." Diehards Line: Dorsey also said that new coach Freddie Kitchens views Johnson as a vital part of the offense. Johnson didn’t show up for the start of voluntary workouts, and Dorsey said that he hasn’t been there yet. But he still hopes Johnson will show up for this weekend’s voluntary minicamp. As PFT suggests, that won’t be good news to Johnson, who is likely looking at the writing on the wall. The Browns extended his contract less than a year ago, but they have also stacked assets at the position. They already had Nick Chubb in place as a bell cow back, and then signed Kareem Hunt, who will be suspended for eight games. Whether they just want to hang onto Johnson as insurance until Hunt comes back, or whether they haven’t gotten a sufficient offer yet, Dorsey seems prepared to dig in on this one for now. The Facts: Rudolph, who will turn 30 in November, said he's out to prove something in his ninth NFL season, which happens to be the final year of his current Vikings contract. "When you've played a lot of football in this league and your name's been around a long time, everyone just assumes you're in your mid-30s and on your way out," Rudolph said Tuesday. "That's not the case with me. I feel like I'm just now starting to get into the prime of my career." Diehards Line: Do the Vikings agree? That's not clear. And lingering ambiguity about Rudolph's future in Minnesota likely only fuels the fire to prove something. But he's proved plenty. 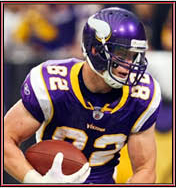 Since he was drafted in 2011, Rudolph ranks fourth among all NFL tight ends in touchdowns (41), fifth in games started (104), 10th in receptions (386) and 12th in yardage (3,787). After dealing with injuries early in his career, Rudolph hasn't missed a game since 2014. And there has plenty of competition. Should the Vikings pick a tight end in next week's NFL draft, it'd be for the fifth straight offseason. Fresh competition is nothing new to Rudolph, who is also familiar with flipping through pages of another new playbook. Kevin Stefanski is his fifth offensive coordinator in Minnesota. And Rudolph's longest touchdown drought of his career (11 games) ended last season in December, during Stefanski's second game calling plays. Paired with newly hired assistant head coach Gary Kubiak, whose offenses have previously leaned heavily on two tight ends, Stefanski's offense could enable Rudolph to prove himself all over again. The Facts: Parker agreed to a new two-year deal, taking a pretty big pay cut in the process, in an effort to finally ignite his career in Miami. 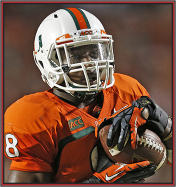 Parker, who has dealt with a litany of injury issues, told Barry Jackson of the Miami Herald he's fully healthy and ready for a "fresh start" with the new coaching staff. "(T)hey have confidence in me again, have trust in me, have faith in me to sign me back again," Parker said. "I just love the atmosphere, the fans, and everyone here. I'm just glad I was able to be here again." Diehards Line:Remember: Parker was gone. Whether by trade or release, it was widely assumed the former first-round pick's days in Miami were over after four exceedingly disappointing seasons. Taking a pay cut helped. The change of staff helped. But the former first-round pick has a long way to go. Coming off a season in which he generated just 24 catches for 309 yards and one TD in only 11 games played, Parker's first goal is to stay healthy for a full season, then he can work on becoming the athletic play maker that got him drafted in 2015. The Facts: To get a better grasp of route-running expectations, Hooper won't alter an offseason routine from last summer when he spent a lot of time working out with QB Matt Ryan. "Yes, I plan to work with Matt after OTAs," Hooper said. "I plan on working with him throughout this seven- or eight-week period, and we will continue to solidify that timing relationship that is between a quarterback and a route-runner." Diehards Line:The Falcons offense for the most part remains relatively intact (outside of RB Tevin Coleman, who signed with the 49ers). But even with a foundation consisting of Ryan, Devonta Freeman, Julio Jones, Calvin Ridley and Mohamed Sanu, Hooper knows the unit will experience transition under new OC Dirk Koetter. For starters, instead of a depth-based passing scheme previously used, the Falcons are switching to a step-based system with Koetter. "On route X, I might have my inside foot up and I know once my third foot on my outside leg hits, I break," Hooper explained. "It's something new that I haven't done before. I just have to work with Matt." The time spent together paid off in 2018, as Hooper totaled 71 catches for 660 yards and four touchdowns on 88 targets in his third professional season. The tight end's numbers represented an increase from 2017 when Hooper totaled 49 catches for 526 yards and three touchdowns on 65 targets. So whatever additional work he puts in seems like a good idea. The Facts: The New England Patriots will kick off defense of their sixth Super Bowl title on Sunday Night Football against a familiar rival. The Patriots will host the Pittsburgh Steelers at Gillette Stadium on Sunday, Sept. 8, at 8:20 p.m. ET on NBC, the NFL announced Wednesday along with the entire 2019 regular-season schedule. Diehards Line: The league decided not to kick off the season with the Super Bowl champs on Thursday night (Sept. 5), but placing the dynastic Patriots in the Sunday prime-time slot to open the season is a worthy consolation. As for that Thursday Night opener, it will be the Packers and Bears. ... Get the full 2019 NFL Regular Season Schedule HERE. The Facts: It was an obvious statement, but one that ultimately needed to be confirmed aloud. Cowboys executive vice president Stephen Jones said Wednesday the team would "obviously" pick up Elliot's fifth-year option. Diehards Line: It's a no-brainer move that will keep the 2016 No. 4 overall pick under contract in Dallas through the 2020 season. NFL teams own the option to pick up the fifth year on every first-round selection's contract. ... As NFL.com notes, the Cowboys know they will have to ante up the dough to Zeke soon enough, but employing the fifth-year option gives the team wiggle room in case talks stall. With Amari Cooper and Dak Prescott both up for free agency after the 2019 campaign, ensuring Zeke is under contract through 2020 frees up the franchise tag just in case the Cowboys need to employ the contract device again. The Facts: The 49ers are reportedly set to open the 2019 season in Tampa on September 8 and the expectation is that Garoppolo will be their starting quarterback for the first time since tearing his left ACL last September. Diehards Line:Word late last month was that the team expects Garoppolo to be full-go when training camp opens this summer and Garoppolo indicated that's his goal as well when he spoke to reporters on Wednesday. Garoppolo, who plans to be wearing a brace on his left knee for that game, also said that he can feel himself incrementally getting back to full speed as the season gets closer. "It's very good to be throwing again," Garoppolo said. "It's what I do. It's encouraging. Every day gets easier and easier, able to make this throw better than I was a week ago. It's small victories like that. Throughout this whole process, it's all about small victories." As PFT summed up, the 49ers hope that Garoppolo's offseason of small victories add up to bigger ones this fall. 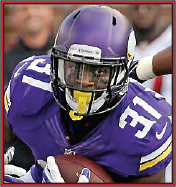 The Facts: McKinnon sustained a torn ACL one week before the team's season opener. He is expected to be cleared for full work when training camp opens in late-July. "I don't have a time table, but when that time comes I'll be ready," McKinnon said. Diehards Line:The arduous rehab has been difficult, but the fact that McKinnon and QB Jimmy Garoppolo are going through it together has been a bright spot for both of them. "It's encouraging being with someone, especially [McKinnon]," Garoppolo said. "The guy is so positive every day. How could you not be in a good mood with him?" The 49ers official offseason program began on Monday, and Garoppolo and McKinnon have clearly built a chemistry during all their time together on the field, as well as in the weight room and training room. "I get to see how hard he works and vice versa," McKinnon said. "It's a lot of time spent together talking through stuff, plays, picking his brain, him picking mine. Just get on that same page for the upcoming season." The 49ers open the season Sept. 8 and both players fully expect to be on the field that day. The addition of Tevin Coleman in free agency will be an issue for McKinnon, but it sounds like the former Viking will be ready to compete for touches.